Despite relatively large amount of data collected the problem to identify the earliest roots of the Vyborny family has not been interpreted unambiguously so far. See also Chronology of early periods page. C) origin from "Dvoraks" residing in the (Nemecky/Havlickuv) Brod region. Even other hypotheses are not excluded too, however (at least the origin of the earliest Vybornys of Pisek region traceable in Berni rula 1654 should be understood). Some of the earliest records available for MUDr.Josef(*1864) Vyborny (deposited now in The State Regional Archive Prague) have been searched thru again and re-evaluated using special experience of K. Kysilka to complete the A) and B) items. Results obtained are inspirative because both some suggestions where to search further and an idea where to look for "the Klatovy Tailor's Book" (the genealogist's comments written in italics). Some of the presented hypotheses need not to be exclusive only (in particular e.g. as to the "Wegborneg/Cerny" legend). They exist multiple good reasons to assume, that the Vybornys around Nemecky (Havlickuv) Brod were from the Okrouhlice estate, having belonged to a circle of free-farmers, called Dvoraks. Their farms were located southern of the city of Nemecky Brod, on the left bank of the Sazava river. Therefore a short introduction to the history of the Okrouhlice estate is necessary. Okrouhlice existed already in Middle Ages - a place belonging to Vilemov monastery in 1390. In 15th century the village and a small fortified house was in hands of Moravian esquire family Okrouhlicky of Knenice. As an independent estate, Okrouhlice existed until mid of 16th century, when it was united with the large estate of Svetla [Svetla nad Sazavou]. Svetla was originally a part of the estate of Lipnice castle, that included Lipnice, cities of Nemecky Brod, Humpolec and Svetla, Vetrny Jenikov, Heralec, former domesne of the Zeliv monastery, and several hundreds of villages. Since 1436 it belonged to one of the most esteemed Bohemian noble families, the Trcka of Lipa. In 1569 the estate of Lipnice was divided into three parts - one third, consisting of the castle of Lipnice, Svetla and Nemecky Brod, was inherited by Burian Trcka of Lipa. Two years later Burian sold the castle of Lipnice to Franz count Thurn. But Svetla with several dozens of villages (Svetla and surrounding villages, Smrdov, Habry and villages, Krupa and villages, villages around Brod, Chotebor, but also a farmstead Zaky near Caslav[!] ) remained in his hands. Meanwhile the city of Nemecky Brod became independent (since 1637 a free royal) city with its own small estate. To it there belonged villages of Perknov on the Sazava, Roznak, Knyk and Zbozice to the north of the city and Sucha and Svaty Kriz in the south. In 1591 an urbar - a register of farmers and their duties - of the Svetla estate was written. Today the original of the register is missing. But there are several descriptions of the urbar from 19th century, which can help us to make a reconstruction of the original register. PELESTROV - a waste empty dominical farmstead with fields, forests and ponds. ZDAR [Vesely Zdar] with 14 settled farmers. (Michal Vacku, Simon Kantoru, Pavel, Jira Kucirek, Pavel Jame, Vanek Kantoru, Jan Bublu, Bures, Hons, Matous Pavlu, Jakub Prenosil, Matej Osvaldu, Matej Soulu, Sima). VADIN with 16 settlers (Filip, Kriz, Kuba, Sestak, Vavra Vaclav, Mates, Matej Rychtar, Vavra na Pakostove, Kaspar na Hyksovne, Havel na Praskove, Vaclav na Mysove, Kaspar, Solta Solove, Barta z Klanecne, Mates, Havel). KLANECNA - only 3 farmers (Barton, Stepanek, Jan Kulha). OKROUHLICE. The register says, that a village Okrouhlice and a near village of Chlistov used to be here. Neither of them exists today. There is only a Landlordïs farm and a mill. VESELICE with 4 settled farmers (Vanek Duben, Simon, Matous, Jira Filipu). PODEBABY with 6 farmers (widow Jana Stepanova, Jan Holanda, Jira Simku, Simon Mlynar, Jakub Nemec, Burian of Vadin). It is quite probable, that ancestors of Vybornys have to be looked for among these "dvoraks". In 1632 famous Albrecht of Wallenstein was murdered in Cheb. One of his friends was Trcka of Lipa, who found his death together with Wallenstein. The emperor confiscated all the Trcka's properties, among others also the estate of Svetla. He passed over this estate to his army leaders. One of them was general Aldobrandini who received Okrouhlice, Vadin, Babice, Zdislavice, Bezdekov, Cekanov, Krasna Hora, Bonkov, Lestina, Skala and who received also the jurisdiction above the dvoraks around Nemecky Brod. Thus the estate of Okrouhlice came again into being. In 1637 Aldobrandini sold Okrouhlice to Filip Adam, count Sulms. [Vesely] Zdar was an independent estate that time. Later it was joined to Dolni Krupa and Habry and in 1670s it was again united with Okrouhlice. The count Sulms was not interested in economical development of his property, he soon fell in debts and had to mortgage or to sell some villages. Until 1662 also the dvoraks belonged under the jurisdiction of the Lipnice estate, as a mortgage. The farmstead of Pelestrov remained waste, too. During the rule of count Solms villages of Podebaby and Chlistov probably became desolated. There were 24 free dvoraks around Nemecky Brod in 1650s to 1670s. There are three resources from that time, which may help us with our research. The first material is from 1651 and is called: "List of subjected people according to their denomination". The second source is Berni rula and the third one the urbar of the Okrouhlice estate from 1668. If we compare these names with names from 1591 register, we can find same names/surnames in several cases: Bastin, Kocman, Novotny, Partl, Rydl and Pansky are on all the three lists. The farmstead, whose owner in 1591 was Vaclav Pabsik, was later confiscated by the landlord and a dominical farm was organized there. This farm was later called Papsikov and after 1785 was emphyteutised and a village of Papsikov was created. In 17th century there was no village of Smolovy. 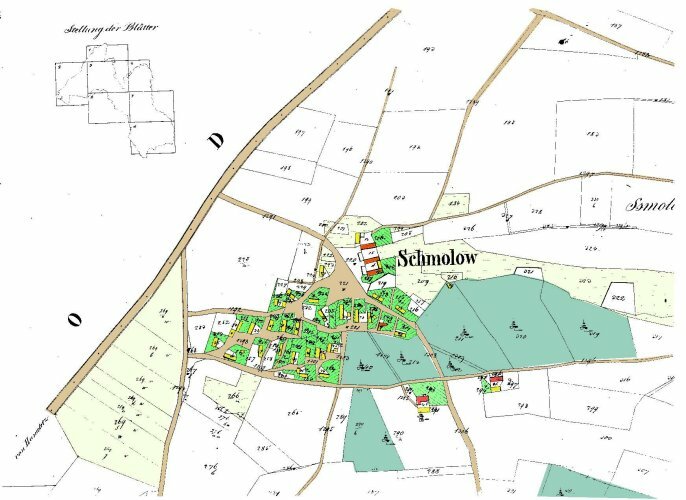 This village came into being before 1742, probably on the place of a former farmstead - the village was named Schmal-hof, in Czech Smolov (Hof in german means yard, court, i.e. home/farmstead). A bit mysterious is the fate of the village Podebaby. It was an old village, existing already in Middle Ages. Then it still existed in 1629, in 1651 there is a similar list of subjected people according to their denomination for Podebaby. But the following list of inhabitants - the Berni rula (the Roll of Assessments) from 1654 makes no mention about this village. The urbar from 1668 omitted the village as well. It knows only a mill of Podebaby, which belonged to 24 dvoraks as well (miller Vaclav Holenda). 25th of January 1718 Pavel Vejbornej, dvorak, was married to Anna Rydl - both Okrouhlice estate. Names of witnesses are illegible. Pavel Vejbornej - dvorak. It was not his surname, but rather a description of his status - meaning he was from the dvoraks circle. His brother was nearly for sure Martin Vyborny, who was landlord's administrator of the farmstead of Pelestrov and died in 1753 there, aged 79 years. The third was probably Jan Vyborny, about whom we know he was widower, when married Salomena Dusek in 1742. In this year Smolovy already existed, since Jan is recorded to have been from Smolov. His son Vaclav is named as son after deceased Jan Vejbornej from the dvoraks. Before 1718, there is no mention of Vyborny surname on the whole estate. As expressed earlier, the Vybornys either came from another dominion (- still the (Kutna Hora trace is not forgotten), or their surname was different earlier. "3.8.1698 Martin Dvorak ze wsy Podebab vzal sobie Katerinu, vdovu pozustalou po + Pavloj Pokornym, niekdy obywateli zdejssim. U przitomnosti: Pavel Fejt, Jan Pansky, Dorota Noskova". It can be translated as: "Aug 8, 1698 Martin Dvorak from Podebaby village married Katerina, widow after + Pavel Pokorny, once local inhabitant . Witnesses: Pavel Fejt, Jan Pansky, Dorota Nosek". The names of witnesses confirm, that Martin was really from the dvoraci. There is only one thing, that should be explained. Did Podebaby belong to area of dvoraci? 1.The urbar from 1668 (not stating the village itself, but only a mill of Podebaby) said, that a mill of Podebaby belonged to dvoraci. 2. List of inhabitants according to their denomination listed all dvoraci under the header: Village of Veselice. Veselice is located NW of Podebaby and Podedaby NW of today's area of dvoraci (OKROUHLICTI DVORACI was a name of a municitality until 1965). It can be assumed from here, that Podebaby belonged to that area. The marriage record does not inform us, which family Martin was from. This has to be an object of further study in birth registers of Havlickuv Brod (and Krasna Hora). It should be concentrated on all dvoraks' families there. Reconstruction of their families in period 1660 - 1720 should be performed. Either this research would support the above stated hypothesis or not. Nearly all surnames of godparents and witnesses are known yet from the lists of dvoraks (incl. Podebaby list 1651) - Klofac - Pansky - Velik. All these names should be checked first in registers. There exists also an another document: the list od "Dvoraks of the lonely houses of the district of Okrouhlice" by about 1780 (they paid to be free of manorial labor). 23 "dvoraks" are recorded there (in fact 24 together with the mill of Podebaby). Vaclav Viborny is listed as #11 (Smolovy). If the above mentioned dvoraks of the 1600's would be coordinated to those of the late 1700's the problem who of them had been Vyborny would be solved, perhaps. 3) Reconstruction of dvoraks families 1660 - 1720 from vital registers of Nem. Brod. - State Regional Archives in Zamrsk.